-- Choose -- New Born 68cm Tiny 68-86cm Micro 92-98cm Mini 104-110cm Midi 116-122cm Maxi 128-134cm Mega 140-146cm Macro 152-158cm Giga 164cm / S Mum S / 164cm Mum M / 175cm Mum L / 180cm Dad M / 180cm Dad L / 185cm Dad XL / 190cm How to fit size? With this NICE 2 EAT U hoodie your outfit will look lavishly good! 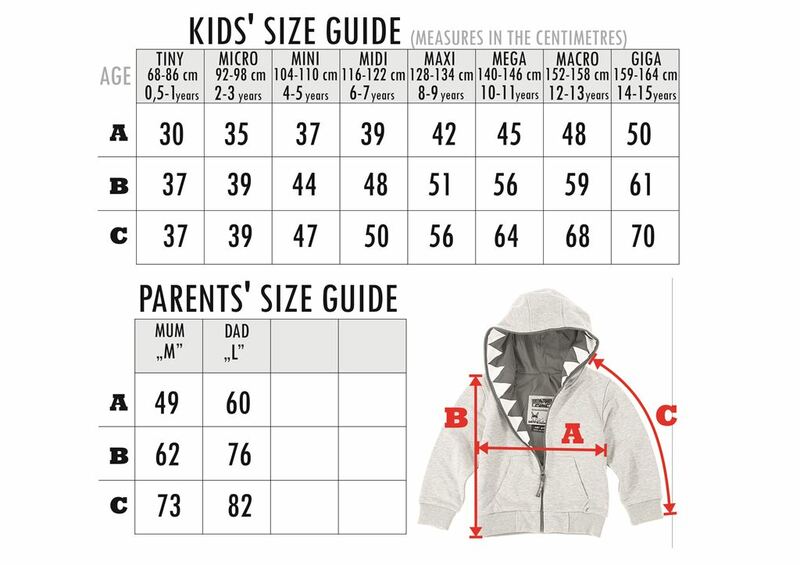 It appears to be an average grey hoodie, but really it is an adventurous type, very wild inside :) Red lining and details at the front and at the back, plus big white teeth along the zipper which goes all the way up. Little fob at zipper pull makes “self-service” easy for the kids. :) On the back, under the hoodie, hides our Little Zombie Dash bunny. An absolute must have for the spring-summer season!